Although 2014 was another big social year, 2015 will be even bigger. There were a lot of important social media news in 2014 like: new redesign of YouTube, Facebook News Feed, Facebook Pages, Twitter or Foursquare, new search capabilities for Twitter and Facebook, new methods of monetization for: Pinterest, Twitter and Snapchat. Everyone is interested in finding useful marketing and social media tips that can be used and have a quick impact on their campaigns. 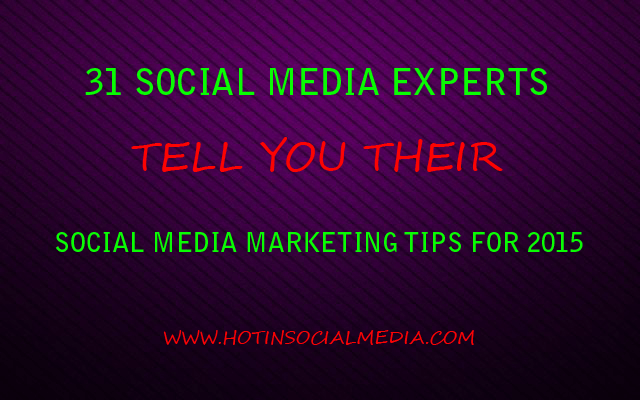 I asked some of the most well known social media experts to tell our Hot in Social Media audience what are their best social media marketing tips for 2015. Below you can read all of these social media marketing tips for 2015 from top social media experts who have a lot of experience and tried a lot of scenarios on many social media networks out there. Her book, Global Content Marketing, was named one of ‘The Top 10 Marketing Books of 2014’ by Inc. Didner is an expert in creating successful global marketing plans that meet local marketing needs. Answer: The most important lesson I learned on social media is to re-purpose and re-use content. For example: one white paper can easily become one short white board video, four different short blog posts, one infographic, a presentation for Slideshare and 4-5 image posts with quotes from the white paper. Creating original content is important but also think of creative ways to re-purpose your most viewed content. You can even turn a one-hour Twitter Chat into one week’s worth of tweets. Vincent Ng is a Pinterest marketer and professional speaker and the founder of MCNG Marketing. As a dynamic speaker he has presented to professional organizations such as the California Hotel and Lodging Association, the Decorative Plumbing and Hardware Association and will be presenting at Social Media Marketing World in 2015. He’s also the author of Pinterest to Profits with Pintalysis and the host of the unofficial Pinterest podcast, Pictures to Profits. He’s happily engaged and looking forward to the day he is married with the love of his life. Answer: When you’re using Pinterest, don’t be afraid to repin older content. If the content has been popular in the past, repin it two weeks or two months later, but don’t just pin it one time. This is because not every one will see your pin the first time around, but they may catch it the second time. And if you haven’t repinned that old pin in months, then chances are you’ve also gained new followers who would be interested in that pin. What may also happen, almost in a magical way, is that the first time you pin something it may not get a lot of repins, but if you pin it a second time you may notice it getting hundreds of repins. My advice is to repin your old pins from time to time to help you drive more traffic back to your site. Ted Rubin is a leading Social Marketing Strategist, Keynote Speaker, Brand Evangelist, and Acting CMO of Brand Innovators. Ted is the most followed CMO on Twitter according to Social Media Marketing Magazine; one of the most interesting CMOs on Twitter according to Say Media, #13 on Forbes Top 50 Social Media Power Influencers, and number #2 on the Leadtail list of Top 25 People Most Mentioned by digital marketers. ROR, #RonR, is the basis of his philosophy…It’s All About Relationships! His book, Return on Relationship was released January 29, 2013. Answer: Use Instagram to share images which allow people the ability to add their own interpretation to what you post. The connection, syndication and relationship building of this tool is invaluable… and fun! Keep in mind that hashtags on Instagram play a very important role in gaining visibility! Make sure you use them. With 15 years experience, Brian Carter is one of the leading authorities in the world on how to get organizations bigger online results. He is the #1 bestselling author of four social media books and has worked with and keynoted for companies that include NBC, Microsoft, Salesforce and many small businesses. Answer: Use an iterative scientific process to improve your results: Create more ads and content and posts (not just one or a few). Then measure which ones create engagement and sales. Try to figure out why some worked and others didn’t. Based on your theories, create another set of ads and content. Constantly improve with this process! As a social media (business) consultant, Natascha co-innovate with her clients to and create marketing strategies that help them reach their business goals. Stephanie started helping businesses get results with social networks before Twitter even existed! Stephanie has worked directly with high profile clients like Oprah, Atlantic Records, Dashlane, The International Culinary Center, & many more. She specializes in helping business owners and marketers find massive ROI by developing targeted social campaigns focused on *engagement strategies* that work! Answer: If you want your customers and audience to be engaged on social media, you have to be active and engaging. They are looking for a leader. You need to set the example. Co-founded CT Social in 2012 and haven’t looked back. Writer, blogger, and social media strategist. Answer: If you’re not doing it already, make this the year you focus on your fans. That means getting serious about interacting and making the effort to build a following.. and then put them in the spotlight. How can you get creative about giving back to your fans this year? best-selling marketing textbook. His blog, the 60 Second Marketer, is read by tens of thousands of marketers around the globe each month and his agency, 60 Second Communications, develops social, mobile and traditional campaigns for well-known brands such as Holiday Inn, TransUnion, Maid Brigade and others. Answer: The big buzzword this year is ROI. So much of the first phase of social media was about setting-up campaigns and driving engagement. We’re only just now starting to scratch the surface of the important aspects of calculating ROI. That said, if you know your customer lifetime value, then you can begin the do the calculation on whether or not your social media campaign is actually generating a positive ROI for your business. In many cases, I think people would be surprised to find that their social media campaigns are NOT generating a positive ROI. But for those who do have a positive ROI, social media is an essential tool. As a freelance writer, Jennifer writes regularly for a variety of sites including SteamFeed, Tweak Your Biz, Curatti, and ME Marketing Services. After spending over 10 years in the B2B corporate world, she is thoroughly enjoying solopreneurship. Answer: One of the most useful social media marketing tips I can recommend is for marketers and small business owners to willingly and regularly engage with and communicate with their audiences. People have always preferred doing business with other people, and this is really no difference between offline and social media marketing these days. Social media gives everyone a voice now, so people are no longer afraid to voice their opinions – both positive and negative – online. They have lost patience with “logos” who either neglect them, provide irrelevant information, or make them wait too long for responses. Marketers must go beyond just “being human” for effective social media marketing – they must also earn the respect of their potential clients. This is how they can develop the credibility and trust they need in order to win online business. Neil Ferree Builds Custom Content Marketing Systems for Small Business Owners to Help His Clients Monetize Their Social Media Marketing Campaigns by Increasing their Online Visibility and Social Media Presence on the Right Social Networks, with the Right Marketing Message to the Right People at the Right Time. Answer: If I were advising a new client on what h/she should add to their existing social media marketing mix, it would be to integrate Feedly, Scoop.it, Buzzsumo and Snip.ly into their social media marketing campaigns. For this SMM approach to be effective, its assumed you’ve done the work to discover WHO your ideal customer is and what are the key issues that keep them awake at night, so the content you create, curate and share delivers significant value if/when they find, read and share you content on the social web. Feedly is my #1 tool for content discovery. Being able to quickly identify which articles, videos and decks have been shared by the Feedly community helps me curate quality content I have a high degree of confidence will resonate well with my target audience. I usually won’t share an article that hasn’t been shared at least 100+ times within the Feedly community. The one downside to using this SMM tactic is that you need to curate top RSS feeds to your Feedly dashboard so your time spent finding awesome content to share can be done quickly. Scoop.it is a powerful smart content suggestion engine that shows me the # of social shares by the big 4 social networks (Facebook, Twitter, LinkedIn and Google+) I still click through and read each article from start to finish to make sure it has the right stuff (e.g.) has a good chance of being seen, found, opened and shared before I will add it to my curation routine. Buzzsumo renders the most shared content for any topic or domain. I’ve already got that task covered in spades via Feedly and Scoop.it. I use Buzzsumo mostly to reveal WHO is sharing MY content on the social web and that of my competitor’s. I created a video tutorial on how I use Buzzsumo for these tasks. You can watch the YouTube video here or you can read my article and view the Buzzsumo video tutorial on my Blog post here. Snip.ly social work flow engine is my ninja hack for driving targeted traffic to my blog using OPC (other people’s content). I stole a page from Guy Kawasaki’s playbook to come up with this social content marketing tactic. Guy uses the NPR model in his social content marketing. He covers this in greater detail in his new book The Art of Social Media. Guy did a podcast with Michael Stelzner from Social Media Examiner where he explains the NPR model and how he uses other people’s content to build and grow his audience. I took his concept and added my Twitter/Snip.ly social share routine into my SMM strategy. Its not all that automated and it takes more time to manually execute this tactic, but the results I get more than justify the extra effort. Brian Honigman is a marketing consultant, freelance writer and speaker. He works with both hot startups like Sumall and big brands like Dell focused on their content marketing, social media and search engine optimization efforts. He’s spoken at NYU, UNICEF, Huffington Post Live and for other organizations and conferences. He is a contributing writer to the Wall Street Journal, Entrepreneur Magazine, the Huffington Post, the Next Web and others. Answer: One social media tip I can’t stress enough is not to rely on social media to make your brand interesting. Social channels help you spread a message, but if you have nothing to say except “buy my product” nobody will listen to you. Spend time and energy doing something worth tweeting, posting or snapping about. Create awesome blog content, make cool videos, host entertaining events. Whatever it is you decide to do, make sure it relates to your brand and your target audience. Follow this advice and suddenly you’ll find that social media success starts coming naturally. Give away some of your very best information for free. By doing this you’re establishing yourself as an authority on the topic and people will want to come back for more. Eventually people will want specialized advice from you in which case I suggest offering a short amount of free time to your audience (I give 15 minutes). I use a scheduling management tool to push links out on social for 1 day a week. That day typically turns into my biggest revenue day because I am able to clarify questions about what I offer and close deals. Answer: After working in media monitoring for many years, I can attest the the power of social listening and paying attention to what’s being said online. Government and big business organisations have been utilising media monitoring for years and its been largely inaccessible to smaller players due to the high costs involved. But social media, and the ever-growing amount of interactions taking place on social platforms, has lowered the entry barriers for monitoring – now, any business can set up a keyword tracking process and get an idea of what’s being discussed about their brand, their local community and their wider industry. The organisations that do utilise media monitoring quickly come to rely on it – the high costs of traditional monitoring are worth it because of the value and insights they can glean from that data. As social listening enters a wider space of awareness, it’s worth every brand taking the time to consider what it may offer them. Questions you have about social media, what platforms to be active on, what content to produce, what will generate engagement and build presence – all of these can be answered by setting up social listening. Tuning in might be the first step towards revolutionizing your marketing and communications process. Keri is the Founder and CMO of Idea Girl Media. Her background includes more than fourteen years in international education connecting people globally and nurturing long-lasting relationships. During that time she was designated by the US Department of State for specific program work, and trained with a former US Ambassador. This positions her well for work with regulated industries. Answer: There are many reasons why brands are on social media ranging from marketing, to customer service to community engagement and more often than not brands are on social because someone told them they needed to be. No matter what the reason is for a brand being on social media and no matter how they’re currently using it the one thing we know for sure is the noise on social is only growing each day. Brands must find new ways to have conversations with their community and the best way on social media today are utilizing communities like Twitter Chats!Twitter Chats are like a good local bar “where everyone knows your name” Twitter Chats are social gatherings at a specific place and time with a common theme that everyone can join. The number of followers you have or the amount of tweets you send in a day aren’t relative in Twitter Chats as those that engage and participate regularly give more than take and come together because they want to engage and learn. So for brands that want to understand what their community is talking about, engage with those who are active, identify those who are currently influential and provide value, twitter chats are the place. There are a lot of learning curves when it comes to blogging and social media growth. I focus on helping others achieve more with their online goals. Answer: Besides the increase in ‘Visual Content’, I say utilize the right Social Media Communities. These Communities have sometimes thousands of members and can get you targeted traffic and help grow your following on that platform. Answer: People usually focus on reaching their followers and while that’s a valid use of social media, it’s not going to help you as much as you’d like. Instead, focus on reaching and connecting with the followers of your followers. Focus on increasing your reach and creating meaningful connections with others, particularly those who have influence over your target audience. As a producer, writer and entrepreneur, Britt likes the excitement and creativity that comes with working on new projects. In addition to consulting for tech companies and television networks in the areas of social strategy and implementation, Britt has appeared on the red carpet as a social media correspondent for the Insider and Entertainment Tonight at events for Vanity Fair, the Daytime Emmys and the Billboard Awards. Answer: I am from the same school of thought as Ted Rubin, Bryan Kramer and others that believe in the importance of the human relationship when it comes to online and offline networking. If you want to build a powerful network, look for ways that you can help others to achieve their goals. When helping others leads you to reach your own goals in the process, the win-win will push you ahead in 2015 and the years to come. Entrepreneur, marketer, 2x author (3rd book coming soon), blogger of online marketing, SEO & social engagement topics. Stage IV Cancer Survivor. socialmediatoday.com Best Thinker and amateur photographer. Meaning, the best traveling salesmen learned to listen, which allowed them to developing better conversations, which lead to trust. As a result of getting to know their audience, they were able to stop selling and begin solving. Prospects drop their defences when they learn you can actually help them solve their challenge. In essence, turning the pitch, onto a relationship. Maggie Patterson is a communications strategist who works with entrepreneurs and corporations to help them craft intelligent communications strategies that boost the bottom line. With 15+ years experience, Maggie has worked with big brands and solopreneurs, and has run her own successful communications agency for nearly 10 years. She is the host of the Marketing Moxie Podcast and her work has appeared on leading websites including Virgin.com, The Huffington Post and Social Media Examiner. Answer: Hands down, the best social media tip I have is try to avoid trying to be everywhere and focus on the networks where your audience actually hangs out. It’s so much better for you to master one or two networks and create strong engagement there versus doing a shoddy job because you’re dividing time and energy. Antonio Calero is a Social Media strategist and coach specialized in user behaviour management. He helps businesses understand better their unique audiences to create effective social media content and campaigns. Answer: Know your audience! This means not only knowing who they are (demographics), but also – and more importantly – how they use Social Media. Understanding user behaviour is paramount for business success, but unfortunately many companies ignore this and simply focus on demographic data, following what other companies are doing. However that approach may not work: not all 25 year old females living in NYC will react in the same way to the same content. Remember that users are human beings, and as such they could change their interests depending on external factors like: season events, current affairs and news, etc… so keep this also in mind when profiling your ideal user. Adel is a Hootsuite Partner and helps companies develop and succeed in their digital strategies, Social Media presence and marketing campaigns which includes SEO, SEM, Social Media and Brand development. 1. Manage your time for social media or social media will manage you. 2. Set a calendar and schedule for each platform. 3. Use tools like Hootsuite to help you manage, monitor, schedule, engage and report. 5. Before you start using Social Media for your business make sure you know Social Media best practices – General rules and platform specific guidelines. I’m a fifty year old living in Perth, Western Australia. Over the years I’ve been an actor, comedian, and freelance writer among other things. These days I’m heavily into blogging, Twitter and SEO. I teach locals in my city how to use social media for promotional purposes in private lessons. Answer: I would say that whenever you are logged into a social network remember that you are connecting with individual humans. (I know it sounds obvious. But people often forget this — or don’t realize it to begin with!) And humans being humans, they are primarily emotional beings. So be mindful of this and consider it whenever you interact with them. Keep thinking how people will feel about what you say or post. And given this, will it achieve your desired effect? There is much talk about the importance of “engagement” on social media. What this really means is emotional engagement. Participate in a way that encourages this to flourish and there’ll be no stopping you. With 18+ years in the licensing, promotions and entertainment business, Jen Kramer has worked with some of the largest companies in the world. From Hearst Magazines to TibECo, she has worked in virtually every category from toys and publishing to housewares and grocery. Jen has a complete understanding of toy manufacturing due to many years at Avon and PPW developing innovative playthings for all ages. Most recently, Ms. Kramer honed her digital skills at social engagement company, SocialVibe (now true[X] media). Answer: Give your consumers something from which they can benefit! It may be interesting brand information, new usage ideas (i.e. Lowe’s home improvement Vine posts), relevant category news or a host of other things. But remember to keep the consumer in mind at all times. Social media is best used as an engagement tool to connect with and build awareness and loyalty among new and existing consumers. Remember, too much self-promotion will surely turn off a brand advocate but give them something that they value and you will have a fan for life! Jacob is a digital marketing strategist and avid video game player living in Portland, Oregon. An early adopter of digital media, Jacob has observed the evolution and adoption of social media in connecting people online. Working as a Director of Marketing he continues to hone his craft and creates social media tutorial videos in his free time. Answer: My most useful social media marketing tip is to use social listening to monitor mentions of your brand name. You can use this information to find consumers who are already fans of your product or service and are acvitly mentioning you online. Build relationships with these people! Setting up Google alerts, Hootsuite keyword streams or using source search on Pinterest to find those who have already pinned images from your site are all good first steps in social listening. A freelance consultant focusing on content marketing, search and social media. Always thinking of Big Data and new marketing techniques. Answer: It’s a silly tip for some but the most valuable tip for most… Complete your entire profile. Add all details about who you are, what you do and links to your website, blog or other social sites. It amazes me how a business will be posting daily on a social site but forget to complete the profile. Followers might share their funny, interesting or informative posts but no one knows who or where those posts are originating. Be sure to make your brand known in a fun non advertising way. Yes, it is a cliché statement. But it works! – Relatable and quality content triggers engagement and shares and builds trust. – A grateful attitude begets more support for your brand. – Great customer care influences word of mouth and increases your reputation. – The more you make it about others, the more they will return the favor. Stuart is a digital marketing strategist living in Kent, UK. Stuart blogs at StuartJDavidson.com, where he shares his extensive freelance and corporate marketing experiences. He is also the author of “How to Win in Social Media”. Answer: One of the most useful social media marketing tips I have always followed was to remain relevant. Ensure your marketing efforts are relevant and you have the ability to attract, convince and convert. Without relevancy, your audience is lost before you even have the chance to demonstrate the value and benefits of your products or services. As a Social Media Manager, I help individuals, businesses, and organizations build web presence through social media. I have taught hundreds of people how to use social media with a focus on fundamentals, application, theory, and productivity tools. I speak on the value of web presence and social media and currently serve as a mentor for veteran business owners seeking advice and guidance about social media. Answer: Don’t think that in order to be effective on social media you must be on every network. Pick the best two or three based on relevant audiences and engage accordingly. Marji J. Sherman extends her passion for genuine brand/consumer engagement on social media platforms to her blog, where she relates real-life experiences to the ever-changing landscape of social media. Answer: Take the time to get to know each and every consumer that engages with your brand. The payoff is incredible for you and the consumer.